Beautiful piece in crafted mahogany. This Drop Down Desk has a many cubbyholes and small drawers. Drawers have rounded drawer fronts to add to its interest. 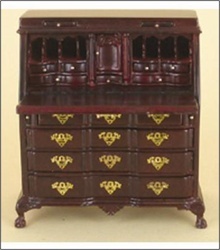 There are 4 large working drawers in the lower half of the desk. There is one flaw of a small ding on the desk surface, otherwise perfect condition.